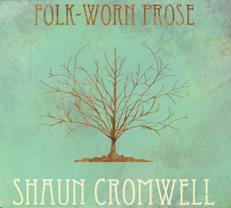 George Graham Reviews Shaun Cromwell's "Folk-Worn Prose"
Having a full rock band can be a useful thing musically. In addition to having more sound, the collective musical talents can combine to raise the general level of musicianship and sonic interest beyond what the composer had in mind. So stripping away a band and working largely solo, for example as a folkie, removes those possibilities, and one is left with the strength of the material and the abilities of the artist in question. In the folk world, often the lyrics and narrative of the music the becomes the focus, compensating for a lack of strength elsewhere. This week we have a new recording by a ostensible folkie who is pretty much the whole package, Shaun Cromwell -- an articulate lyricist, but also a fine guitarist who also plays some banjo, does very attractive vocals and serves as producer. As a composer, he creates music that is stylistically eclectic and has a good deal more depth than is typical for a folkie. His new CD, his second, is called Folk-Worn Prose. Shaun Cromwell lives in Los Angeles, and has worked as a mix engineer for various TV shows. He released his debut album, The Turning of Clocks in 2007, a strictly solo recording which was based on the theme of mortality. He has done some touring playing in bands with others, including Trisha Gagnon. Now he is out with Folk-Worn Prose which though the instrumentation is still scaled back by pop music standards, is wider-ranging sonically. Over the last couple of years, Cromwell has taken up the banjo and he includes it on the new CD, giving it an old-timey or traditional folk texture at times, but he also has a bit of a ragtime streak, imparting a kind of nostalgia-tinged aura. The added instrumentation on this largely self-recorded CD include tuba and accordion. As a lyricist Cromwell is inventive and articulate, often including some vocabulary words that one does not often hear in folk or pop songs, but more perhaps along the lines of Tin Pan Alley wordsmiths. But he also includes two instrumental pieces. And as a vocalist, Cromwell has a slightly weathered, but still smooth voice that is a bit reminiscent of Jack Johnson or Tim O'Brien. Altogether it makes for an album that has a lot going for it -- more than would seem apparent from its appearance as what may seem like just another folk singer-songwriter album. Shaun Cromwell is one of who-knows-how-many hundreds of acoustic folk-singer-songwriters on the scene. But his new CD Folk-Worn Prose shows that the form still has endless possibilities. Rather than letting the scaled-back instrumentation be a limitation, Cromwell invokes a variety of influences from old-timey country to ragtime to more contemporary. He's a great writer. His compositions are outwardly simple in sound but hold a good deal of musical and lyrical sophistication. He's got a very appealing musical persona, and he's a tasteful guitarist, joined by a variable small group of like-minded players. Our grade for sound quality is a B-plus. The acoustic instrumentation and vocals are well-recorded and have a generally pleasing sound. Cromwell himself did the mix. But in the mastering process, the same mindless, loudness-at-all-costs approach that afflicts far too many CDs was used to crank up the volume and thus lose the dynamics of the performance. Yes, it's another folkie album in a very crowded field by a relative unknown, but Shaun Cromwell is a particularly well-rounded artist in the field, and his Folk-Worn Prose is both memorable and very appealing.